After 2 years of hard graft the boat was finally ready for the water. Two years – that was how long it had taken us. Looking back, I can hardly believe that we managed to achieve so much in such a short period. In two years we had turned a badly-built, 50 foot hull and deck into a sturdy, seaworthy vessel! However, at the time it did not seem to us that we had achieved anything remarkable; indeed, at the time it felt to us as if we were working with iron balls chained to our ankles and the endeavour seemed to have taken forever. Some people build boats to build boats – but that wasn’t us. We built a boat to go sailing. 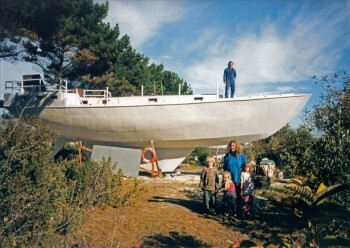 Thus, by definition, every moment spent building the boat was a moment wasted; a moment spent not-sailing. Given this attitude, how did we keep on with the project? 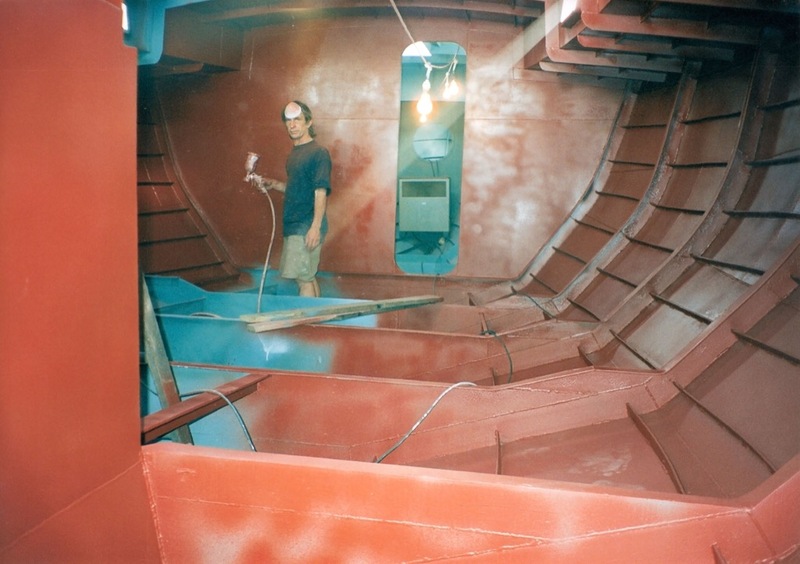 After the launch we moved into the bare hull – and work continued. Two years to build a boat would be pretty good going – surely, even the most desperate stranded merfolk could keep going for that length of time? – but alas, when I say that we had created a seaworthy vessel I do not mean that we had finished the project. Au contraire. 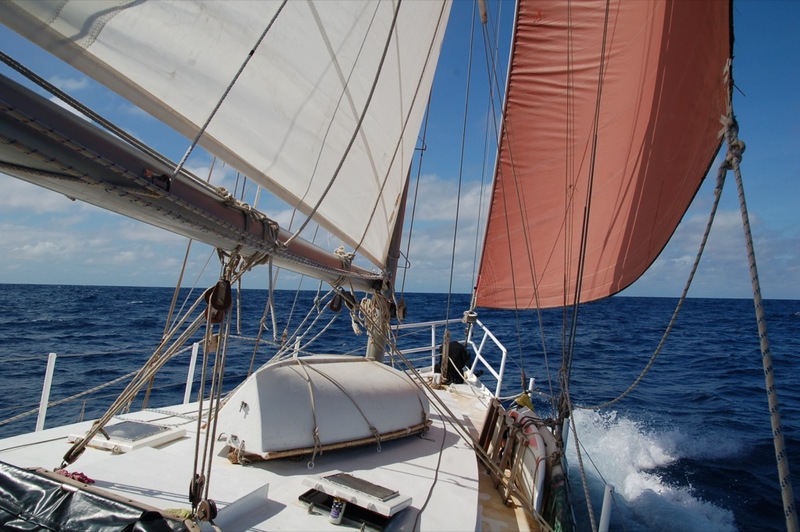 Two years was the time taken to transform a rusting, poorly welded, would-be gaff-rigged schooner into a Lloyds-standard, beautifully painted, would-be Bermudan-rigged ketch. It was the plateau which we reached before we rushed ahead of ourselves and put the boat onto the water. At this stage the vessel wasn’t even rigged; and at this stage she didn’t have bunks, a loo, or a cooker. In fact, she didn’t even have floorboards. 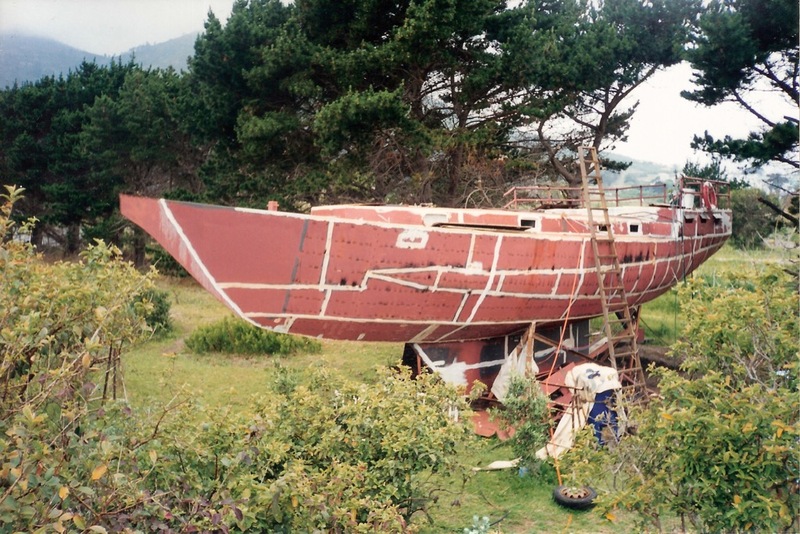 Two long, hard, back-breaking years was the time it took to get Mollymawk to the stage which I, in my ignorance, thought she was at when we embarked on our boat building project: the stage where she was just about ready to be fitted out. How came we to this pretty pass? 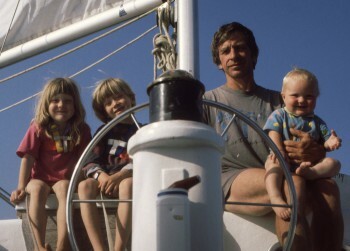 Before we embarked on our boat building project, Nick and I were the owners of an elderly and well-travelled GRP ketch. 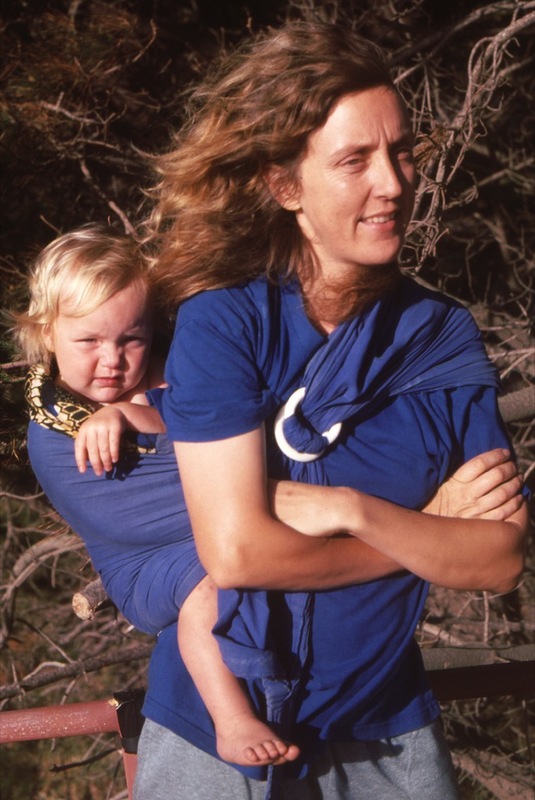 Maamari had carried Nick and his parents around the world, and she had subsequently been home to us and our children for seven very happy years. 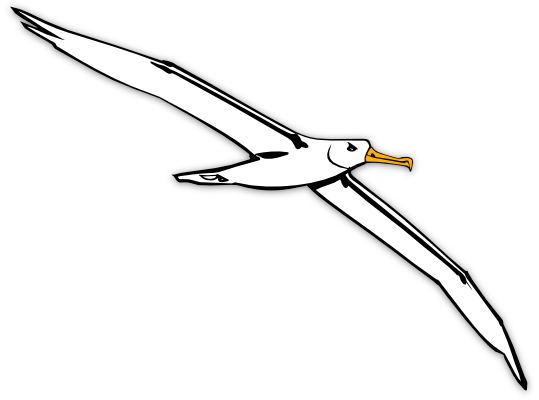 That she was eventually rolled in a Southern Ocean storm was through no fault of her own; and that she survived and kept her crew safe from harm was testament to her sound design and her construction. But we wanted something even better. 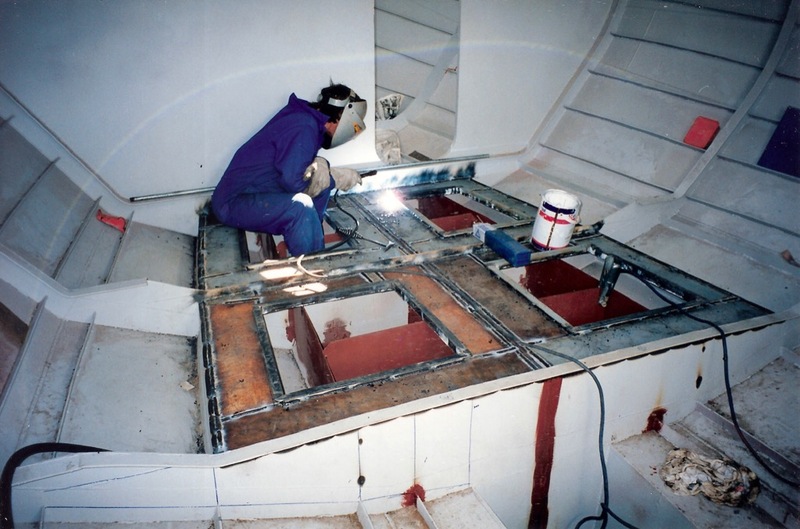 In the light of our misadventure we decided to convert to steel; and when we found that we couldn’t afford to have a steel hull built we looked around and found a cut-price, half-finished project. The idea of buying something second-hand appealed to our urge to walk lightly on the Earth, and thought that the boat was half-finished appealed to that desperate desire to get back out onto the ocean as fast as possible. Mollymawk was the name which we gave to our new home-to-be. She was bigger than we needed or wanted; but she was cheap, and at first glance she seemed to be well-built. Alas, that impression was soon shown to be mistaken. The workmanship was so poor that when Nick dropped one of the bulwarks, it broke in half. And thus we ended up having to re-weld the entire hull. But here is the crux of my story, for when I say “we”, the truth is that I mean he. Together, Nick and I perused the faulty welds and resolved to grind them all out and begin again. Together we designed the deck layout; together we decided on the position of the hatches. Together were the decisions made – but he was the one who operated the cutting torch, the grinder, and the welder. Together we thought, but he alone acted. And I, meanwhile, got on with all the usual housewifely chores, such as cooking the dinner and raising our three young children. So, did I push to one side concerns about the boat, devoting myself totally to my own duties? From the moment that we started work on Mollymawk, the sandblasting of the hull was our goal. Sandblasting seemed to signify the end of the metalworking era and the start of that which we had come to do: namely, the fitting out! “You’ll have those curtains up soon, Jill”, quipped the farmer who owned the field where our home-to-be was stranded. However, boat building is like mountain climbing. Gaily and with a springing step one starts along the trail, but the journey is always longer and harder than anticipated. Each ridge, as we approach it, looks like the summit; but as we top the rise our hearts sink. There is another higher ridge beyond. After two years of hard graft the boat was blasted and painted. Sandblasting had seemed to be the summit of our mountain; from that peak we would run down to the sea. But the summit, when we reached it, turned out to consist of a confused jumble of peaks and the sea was still a long way off. 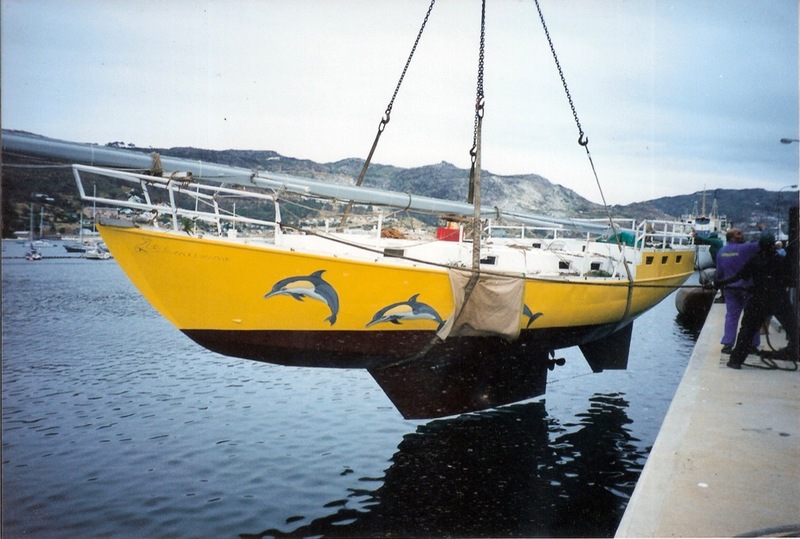 After the sand-blasting we still had to fit the boat with water tanks and a steering system; we still had to install the engine, and we had to create the rig. And logic demanded that all of this be done before we could embark on the business of crafting the homely interior which I had planned. Nevertheless, our farmer friend was right in one respect. 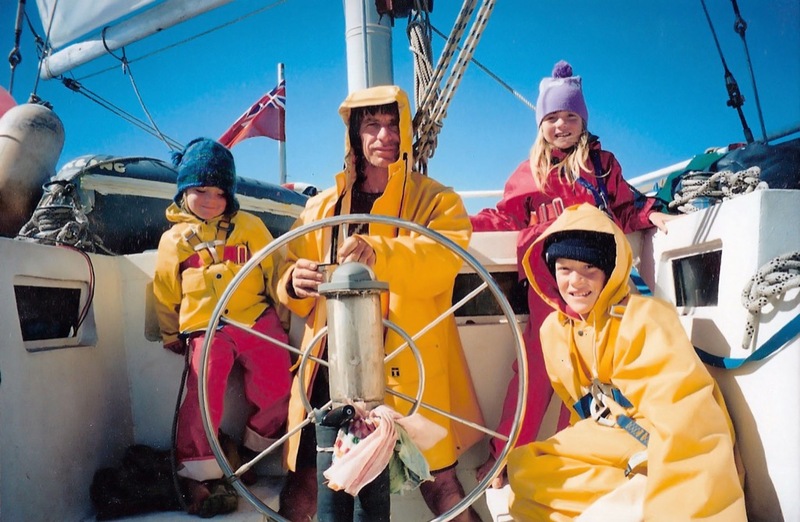 Indeed, he had hit the nail on the head: So far as Nick was concerned, Mollymawk was an interesting project, but so far as I was concerned the project was simply an obstacle to be surmounted before we get on with the business of liveaboard cruising. A boat building project is Unreasonable Behaviour. Viewed merely as a means to an end, the construction of the boat is not so much a creative undertaking as an ordeal to be endured; and since the ordeal is almost certain to last far longer than was anticipated, its burden can easily become intolerable. Only the fittest survive the boat building adventure. The boat-sheds and barns of our countryside are not exactly littered with half-built rusting hulks, but I’m sure we all know of one or two of these testaments to a failed dream. Meanwhile, I would not be at all surprised to learn that “Boat Building Project” is on the list of acceptable grounds for divorce. If it isn’t there in its own right, I’m sure it’s there as a sub-category of “Unreasonable Behaviour”. Well, the key to surviving the boat building adventure is to enjoy it. And the key to enjoying it is to be completely absorbed in the process. Throughout much of the average person’s average day our bodies are present and correct, but our minds are playing in the never-never land of the future or in the story-time world of our memories; and as the Buddhist masters have been pointing out for 2,500 years, neither of these time-zones is actually any more real than a dream. Most folks are perfectly content to live much of their life in this fashion, but it isn’t the way to maximise your time on this earth and – more to the point – it certainly isn’t the optimum way to get through the long drawn-out process of crafting a floating home. The creator, himself, is bound to be mindfully absorbed in his work. 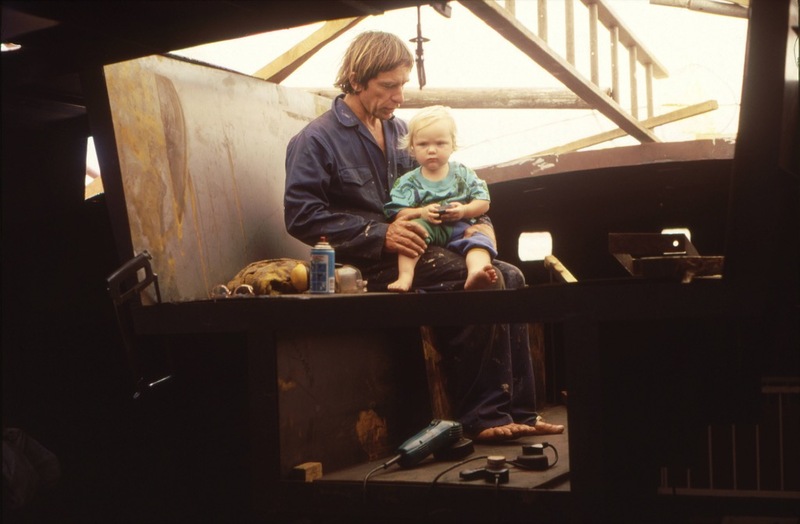 As it happens, much of the activity of boat-building forces us to be absorbed in our work. You can’t measure up a sheet of plywood or operate a welder without being very carefully mindful. If your attention wanders, even if only to the fact of needing to purchase new jigsaw blades or some more welding rods, then you are likely to end up with the wrong shaped bulkhead or a weld stuffed with impurities. Indeed, you might even wind up sawing into your finger or burning a hole in your boiler-suit. Given this fact, the man or woman who is doing the actual work of constructing the boat is almost certain to be mindful for much of the time; and, being mindfully absorbed, he/she is, almost by definition, content in his/her work. But what about the sleeping partner? 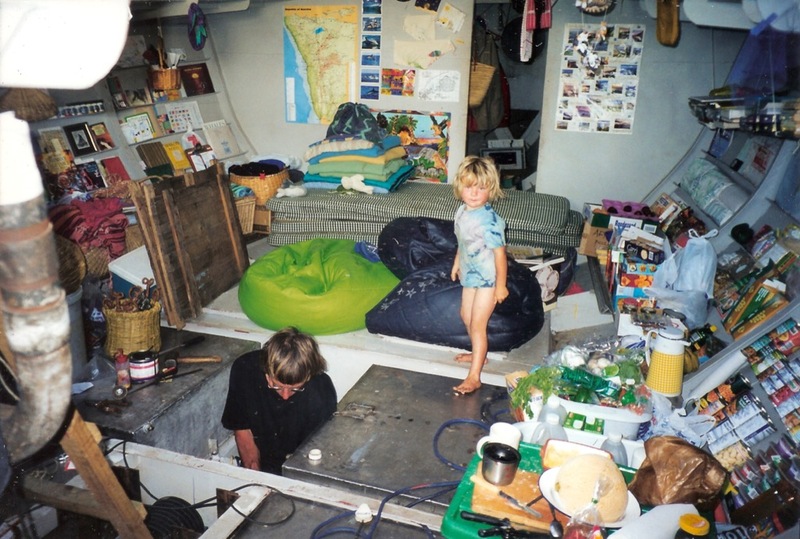 Where the captain-to-be and the mate are both deeply involved in the actual hands-on work of putting a boat together then, I imagine, there is harmony in the home. However, as a general rule this is not the case; as a general rule, boat building is a man’s world. So, I repeat – what of the Significant Other? How can a builder’s wife enjoy the days, weeks, months, and years which will be devoted to turning out a boat? Since much of our daily life is taken up with doing things which don’t require our full attention, women seldom live in a mindful way. We are, in fact, the acknowledged masters of multi-tasking: of washing the dishes whilst half-listening to a rant about the price of epoxy paints and simultaneously planning tonight’s supper. We drive the car, we shop, we clean the bath… We even manage to sail the boat without being mindfully present. They also serve who only stand and wait – but they don’t get much job satisfaction. For the back-up team, a boat building project is apt to be much the same. Whereas the hero of the piece gets the pleasure of being engrossed in his masterpiece and has the satisfaction of watching his creation take shape, those of us who only stand and wait and make sandwiches do not have the same opportunities. It’s hard to take pride in the fact that you chipped all the slag out of the welds. To remain mindfully absorbed in such a tedious chore is even more difficult – it’s the sort of task which positively begs to be undertaken with the mind far, far away, in a more pleasing location – but if one is going to enjoy the boat building process and not become resentful of the time which it takes – if one is not to regard these long hours of drudgery as time which has been stolen – then one needs to forcibly develop the twin skills of mindfulness and pride in achievement. Our experience of any given situation is a matter for our own interpretation, and it therefore lies within the power of our own minds to make it either positive or negative. When we are fully present, so to speak, then we force ourselves to become absorbed in what we are doing; and if you try this trick you will discover that one consequence of total absorption is a really surprising level of contentment. The other result of mindfulness is a much more willing acceptance of now – of this moment, and this day, with all its set-backs, delays, and unsatisfactoriness. Eventually one realises that the torture associated with being married to a half-built boat is entirely self-wrought; and if one lets go of the mind state which wants the thing to be over and done with so that the fun can begin, then one can enjoy the fun which (it turns out) is also inherent in the present moment. As the man said, “Life is what happens to you while you’re busy making other plans.” Or, to put it another way – if it’s raining and you’re cold, there’s not much sense in making things even worse by being miserable about it, is there? The boat building project which you thought would take three years could easily take ten – or more – and are you really going to waste your life being regretful and pissed-off throughout all of that time? Why build a boat when you could go sailing instead? Few things surpass the satisfaction of crossing an ocean in a boat of your own making, but the project requires a big investment of time and energy – and when all is said and done, crossing an ocean in a boat of someone else’s making is pretty satisfactory, too! “I’ll just grit my teeth and knuckle down to it, and in a couple of years’ time we’ll be living it up in the sunny Caribee!” If you catch yourself thinking like that, think again – please. Don’t build a boat because you want to go sailing. 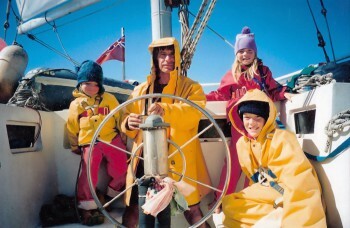 If you want to go sailing, get online and search for a ready-made bargain. If you think you want to build a boat, research the business thoroughly in advance, be sure that your partner also understands what is involved in terms of time and trouble; and if you decide to commit yourself to the undertaking let the result be of little concern. Let the pleasure of building your boat lie in the act of creation. According to my experience, any other approach is simply a form of self-flagellation. Hi Jill, Love this article. 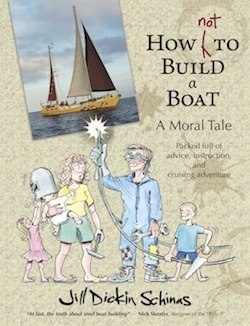 You’ve certainly highlighted many of the often conflicting emotions and realities of boat building. As a backyard builder I can also attest to some moments when the task seems too much. I just have to remember to focus on each individual stage of the overall build. It can be hard however not to dream of getting out there. Here’s a poem written by my wife which may give some insight as to her view of the project. whatever sun comes through the window. elements yield to his will. tell tails in an impatient wind. as I do, begging my God for a deluge.